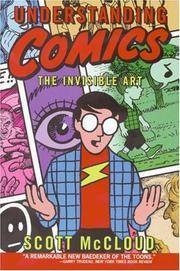 Understanding Comics: The Invisible Art is a 215-page non-fiction comic book, written and drawn by Scott McCloud and originally published in 1993. It explores the definition of comics, the historical development of the medium, its fundamental vocabulary, and various ways in which these elements have been used. It discusses theoretical work on comics as an artform and a communications medium. It also uses the comic medium for non-storytelling purposes. 1999-09-01. New. Ships with Tracking Number! INTERNATIONAL WORLDWIDE Shipping available. Buy with confidence, excellent customer service! 1994-07-08. New. Ships with Tracking Number! INTERNATIONAL WORLDWIDE Shipping available. Buy with confidence, excellent customer service! 1994-06-05. New. Ships with Tracking Number! INTERNATIONAL WORLDWIDE Shipping available. Buy with confidence, excellent customer service! 1993-08-05. New. Ships with Tracking Number! INTERNATIONAL WORLDWIDE Shipping available. Buy with confidence, excellent customer service! 1994-07-08. Good. Ships with Tracking Number! INTERNATIONAL WORLDWIDE Shipping available. May not contain Access Codes or Supplements. May be ex-library. Shipping & Handling by region. Buy with confidence, excellent customer service! Kitchen Sink Pr. Hardcover. 0878162445 Please allow 4 - 14 business days for Standard shipping, within the US. Thank you for supporting our small, family-owned business! . New. 1993-08-01. 2nd. Kitchen Sink Pr. Hardcover. 0878162445 Please allow 4 - 14 business days for Standard shipping, within the US. Thank you for supporting our small, family-owned business! . Fine. 1993-08-01. 2nd. 1993-09-08. Good. Ships with Tracking Number! INTERNATIONAL WORLDWIDE Shipping available. May not contain Access Codes or Supplements. May be ex-library. Shipping & Handling by region. Buy with confidence, excellent customer service! Tundra Pub, 1993-01-01. Paperback. Used:Good. Kitchen Sink Pr. Hardcover. 0878162445 Please allow 4 - 14 business days for Standard shipping, within the US. Thank you for supporting our small, family-owned business! . Fair. 1993-08-01. 2nd. Kitchen Sink Press, Incorporated, 1993. Hardcover. Good. Disclaimer:A copy that has been read, but remains in clean condition. All pages are intact, and the cover is intact. The spine may show signs of wear. Pages can include limited notes and highlighting, and the copy can include previous owner inscriptions. At ThriftBooks, our motto is: Read More, Spend Less.Dust jacket quality is not guaranteed. Paw Prints 2008-04-18. LIBRARY BINDING. 143524284X New Condition. . New. Paw Prints 2008-04-18. LIBRARY BINDING. 143524284X Like New Condition. . Fine. Kitchen Sink Press, 1993-01-01. Paperback. Used:Good. William Morrow Paperbacks. PAPERBACK. 006097625X New Condition. . New. Harper Collins. PAPERBACK. 1563895579 New Condition. . New. Kitchen Sink Press. PAPERBACK. 0878162437 New Condition. . New. Tundra Pub. PAPERBACK. 1568620195 New Condition. . New. Turtleback Books. SCHOOL & LIBRARY BINDING. 0613027825 New Condition. . New. HARPER PERENNIAL CURRENTS. New. 10.28 x 6.84 cm. William Morrow Paperbacks. Paperback. 006097625X Please allow 4 - 14 business days for Standard shipping, within the US. Thank you for supporting our small, family-owned business! . New. 1994-04-27. Reprint. 1993-08-05. Good. Ships with Tracking Number! INTERNATIONAL WORLDWIDE Shipping available. May not contain Access Codes or Supplements. May be ex-library. Shipping & Handling by region. Buy with confidence, excellent customer service! Dc Comics, 1999-05-01. Paperback. Used:Good. Kitchen Sink Pr (Nrt). Used - Good. Shows some signs of wear, and may have some markings on the inside. Paw Prints 2008-04-18, 2008-04-18. Library Binding. Used:Good. Turtleback Books. SCHOOL & LIBRARY BINDING. 0613027825 Like New Condition. . Fine. 1999-09-01. Good. Ships with Tracking Number! INTERNATIONAL WORLDWIDE Shipping available. May not contain Access Codes or Supplements. May be ex-library. Shipping & Handling by region. Buy with confidence, excellent customer service! 1994-06-05. Good. Ships with Tracking Number! INTERNATIONAL WORLDWIDE Shipping available. May not contain Access Codes or Supplements. May be ex-library. Shipping & Handling by region. Buy with confidence, excellent customer service! Turtleback, 1994-04-01. School & Library Binding. Used:Good. Paw Prints 2008-04-18, 2008-04-18. Library Binding. Good. Harper Collins. PAPERBACK. 1563895579 Please allow 4 - 14 business days for Standard shipping, within the US. Thank you for supporting our small, family-owned business! . Fair. William Morrow Paperbacks. Paperback. 006097625X Please allow 4 - 14 business days for Standard shipping, within the US. Thank you for supporting our small, family-owned business! . Fine. 1994-04-27. Reprint. William Morrow Paperbacks. Paperback. 006097625X Please allow 4 - 14 business days for Standard shipping, within the US. Thank you for supporting our small, family-owned business! . Fair. 1994-04-27. Reprint. William Morrow Paperbacks. PAPERBACK. 006097625X Like New Condition. . Fine. Harper Collins. PAPERBACK. 1563895579 Like New Condition. . Fine. Tundra Pub. PAPERBACK. 1568620195 Like New Condition. . Fine. Kitchen Sink Press. PAPERBACK. 0878162437 Like New Condition. . Fine. Kitchen Sink Press. Used - Very Good. Former Library book. Great condition for a used book! Minimal wear. Kitchen Sink Press, Incorporated, 1993. Hardcover. Good. Disclaimer:A copy that has been read, but remains in clean condition. All pages are intact, and the cover is intact. The spine may show signs of wear. Pages can include limited notes and highlighting, and the copy can include previous owner inscriptions. An ex-library book and may have standard library stamps and/or stickers. At ThriftBooks, our motto is: Read More, Spend Less.Dust jacket quality is not guaranteed. William Morrow Paperbacks, 1994-04-27. Paperback. Like New. Nice looking book, has minor edge wear. William Morrow Paperbacks. PAPERBACK. 006097625X Special order direct from the distributor . New. William Morrow Paperbacks. PAPERBACK. 006097625X Brand New ,Original Book , Direct from Source , Express 5-8 Business days worldwide Delivery. . New. Harpercollins, 1994. Trade Paperback . New. We carry new and used books in our storefront. We want you to be satisfied with your purchase. Please contact us if you have questions regarding this item.